Not ice, salt. Probably somewhere like the Great Salt Lake. I’m thinking it really is ice, just because of the broken icicles at the top of the picture. 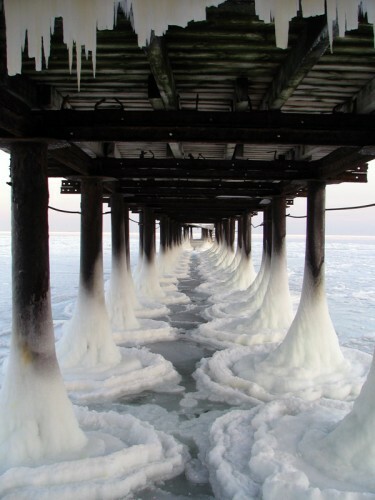 Salt is crystalline and can form stalagmites and stalactites just like anything else can. Pretty sure this is a repost. We have a go for main thrusters! @Senshi I kno right, that was my first thought. The white on black at the top looks like skyscraper silhouettes. I really couldn’t imagine ice doing that, but sometimes nature is one crazy mother.